It’s time to get the straight facts about blind or visually impaired people during Blindness Awareness Month in October. Organizations around the world inform the public about good eye health and the latest innovations in research. It’s also an ideal time to clear up any misconceptions about the daily lives of blind or visually impaired people. Follow inspirational stories by and about people who successfully go beyond victimization and depression to the joys of living satisfying lives. Learn how blind and visually impaired people are advocating for more resources and full recognition as valuable members of society. ​The 66th World Health Assembly replaced Vision 2020 with the Global Action Plan for the Prevention of Avoidable Blindness and Visual Impairment 2014-2019. The Little Rock Foundation in Naples, Arkansas successfully lobbied for a bill creating Blindness Awareness Month each October as a way to promote improving blind and visually impaired children's lives. ​In honor of Louis Braille's bicentennial birthday, Congress approved a commemorative coin with $4 million of the proceeds going to Braille literacy programs. ​The International Agency for the Prevention of Blindness proposed Vision 2020 to advocate eliminating needless visual impairment and helping those with unavoidable vision loss reach their life's full potential. ​The National Federation of the Blind created the Newsline For The Blind — giving blind and visually impaired people access to newspapers, magazines and other periodicals using touch-tone phones. In the name of a relative, friend or even yourself — make a donation to a an organization dedicated to helping people with vision problems. Organizations like the National Federation of the Blind or the Foundation Fighting Blindness work year-round to fund research to prevent and cure conditions causing vision impairment or blindness. Much of this work centers around genetics, transplantation, retinal implants and nutritional and pharmaceutical therapies. Your dollars can take this research far. Do you know a legally impaired or blind student? Does your elderly neighbor struggle to read books, newspapers, or magazines? Here's your chance to step up. You can also locate a free reading service in your community and make a big difference to someone who may even be newly-diagnosed and feeling overwhelmed. VisionWalk is a fundraising engine in the fight against sight loss. VisionWalk, a 5K event, raises thousands of dollars each year to fund much needed research to save sight. The Foundation Fighting Blindness, a non-profit organization, runs the event but also makes sure VisionWalk is fun and and a way to bring together individuals, groups, and teams who want to make a difference in the lives of the blind and the visually impaired. ​Diabetics are 25 times more likely to develop blindness or visual impairment than non-diabetics. ​You might think that the majority of places hit by vision loss are in third world countries but 90% of visually impaired and blind people reside in developing countries. ​Most visually impaired people start losing their eyesight at 50 with a gradual deterioration as people continue to age. Eighty percent of all visual impairment is preventable so it pays to get those annual eye exams — plus if you HAVE to wear them, red eyeglasses are hot! ​Although it's hard for people today to imagine, earlier civilizations punished the blind by abandoning babies, forcing women into prostitution and turning men into galley slaves on ships. Visual impairment ranges from low to severe in impact. It is primarily an age-related condition that defies correction by prescription glasses or medicine, contacts or surgery. If you are legally blind, there may still be some limited vision in one of your eyes. 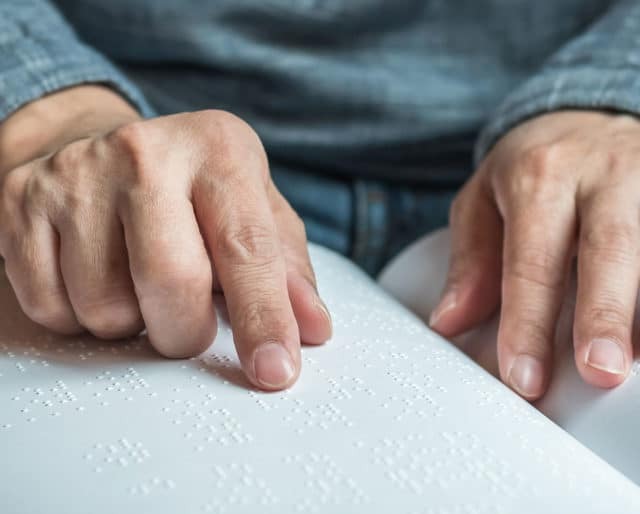 If you are totally blind, you probably use braille, listen to audio communications for media and daily instructional information, or you may need the services of a seeing-eye dog. The World Health Organization estimates that there are over 285 million visually impaired people, 245 million with low vision and 39 million totally blind people. Sixty-five million people are afflicted by cataracts — and in the U.S. alone, over ten million people suffer from retinal diseases that deteriorate peripheral and night vision. One of the major causes of blindness is uncorrected refractive errors causing blurred vision, leaving people unable to clearly see images on the retina. Blind and visually impaired people love and have families, work jobs, ride transit, volunteer, communicate and live their lives just like everybody else. The only difference is that this community relies on special tools and resources that help them cope with limited or no vision. Blindness Awareness Month gives blind and visually impaired people a platform for telling their own stories as well as inspiring others to overcome the stigma of their disabilities. This month reminds us that we don't have to be defined by our physical limitations.